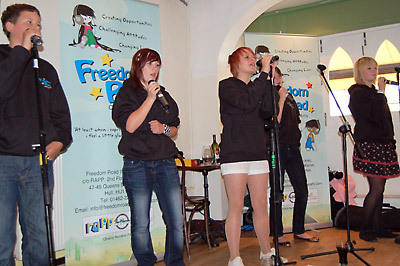 On Sunday 10th August, Freedom Road Creative Arts was officially launched at Zest Cafe bar on Newland Ave. Around 70 people turned up to watch Freedom Road perform songs from their new CD "All My Life", as Chair of the Charity Rev. Tom McCready and Secretary Kay Bolton spelt out the vision for the next year and Councillor Christine Randall attended to offer her support. Before going on stage Freedom Road were treat to a Limo ride curtoisy of At Liberties for all the work they put in to making the recent visit to Keble Ciollege in Oxford a successful one.